Kickstarter Says It 'Is Not A Store' As It Revises Policy On Projects' Risks : The Two-Way Even as it has been praised for bringing innovative ideas to life, Kickstarter has been criticized for allowing creators to be a little fuzzy about their plans — and for providing little recourse to investors who are unsatisfied with a project they supported. The site has announced changes it hopes will ease the confusion. 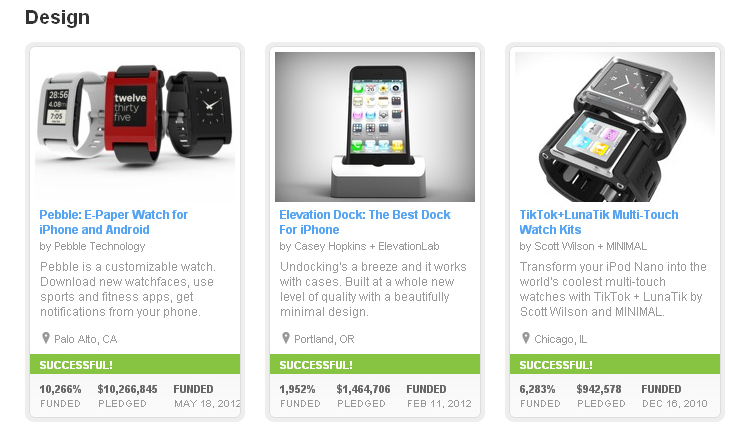 A screengrab shows three highly funded Design projects currently on Kickstarter's site. The company's founder say they will require more information about the challenges potential entrepreneurs could face. Even as it has received praise for bringing innovative ideas to life, Kickstarter has been criticized for allowing creators to be a little fuzzy about their plans — and for providing little recourse to investors who become unsatisfied with the project they've supported. The site has now announced changes that it hopes will ease those troubles. The biggest change is a new section called "Risks and Challenges," which requires potential entrepreneurs to list the obstacles they face, and how they plan to deal with them. The changes were announced in a company blog post titled "Kickstarter Is Not a Store." They follow an earlier clarification of Kickstarter's policies that was spurred by an All Things Considered story by Aarti Shahani, titled "When A Kickstarter Campaign Fails, Does Anyone Get The Money Back?" Aarti's story focused on entrepreneurs who were successful in raising money on Kickstarter — in some cases, surpassing their goals and collecting millions of dollars — but who then faced uncertainty about how to fulfill Kickstarter donors' expectations, and their own sense of fair play, if they hit roadblocks. Another question centered on whether Kickstarter patrons should be viewed as customers or donors. "Technically, from the Kickstarter perspective, I actually don't know the answer to that," gaming entrepreneur Julie Uhrman said in that story. "But from a doing-the-right-thing perspective, we will treat our backers the best possible way." The story sparked a post on Kickstarter's blog, in which the company's founders said they were committed to accountability. They also explained the process of screening and completing projects, as well as the idea of refunds. "Kickstarter doesn't issue refunds, as transactions are between backers and the creator," the post reads. "In fact, Kickstarter never has the funds at all." In Thursday's post about their new policies, company co-founders Yancey Strickler, Perry Chen and Charles Adler urged potential innovators to promise only what they can deliver. "Over-promising leads to higher expectations for backers," they wrote. "The best rule of thumb: under-promise and over-deliver." But going by the comments on the post, most folks were confused by new rules for hardware and product designs, which forbid renderings and simulations of the products. Any images should be of prototypes, the site says. "Products should be presented as they are," the founders wrote. Later, they added, "We hope these updates reinforce that Kickstarter isn't a traditional retail experience and underline the uniqueness of Kickstarter."